practices. Invaluable professional connections serve student professional immerse students in professional workplace settings. Multiple internships increase competence and expose students to outstanding opportunities often leading to post-graduation positions! 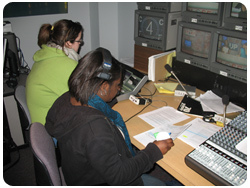 Mass Communication students are required to complete at least 1 credit hour with a maximum of 3 credit hours at an off-campus professional internship or practicum. Where as, Integrated Marketing majors must complete an internship. One to three internships may be taken for a maximum of 1 to 3 credit hours. Internships provide an opportunity to gain real world experience in college. Employers want evidence of professional experience, preferably through two or three internships. Internships can lead to job offers at the internship placement. Internship forms are available on the department's forms page.